One of the biggest names in racing. From a welthy Brazilian family, Ayrton was racing karts from a very early age and had amassed eight seasons experience before coming to Britain to make his Formula Ford debut in 1981. 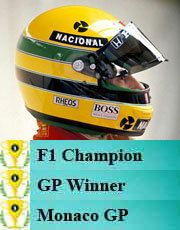 In may 1994 one of darkest racing weekends when Ratzenberger died in practice and Senna in the race at Imola. Possibly the steering column broke or the car became unsettled on the bumpy track surface, the Brazilian appeared helpless as it ran into the concrete wall at the Tamburello corner. A part of the suspension came back and killed Senna.